One of Plymouth’s leading engineering firms is helping to shape the future of its local University’s research facilities. The Barden Corporation has joined the advisory board for Plymouth University’s Centre for Advanced Imaging Analysis and Characterisation, which is used by University researchers and industry. 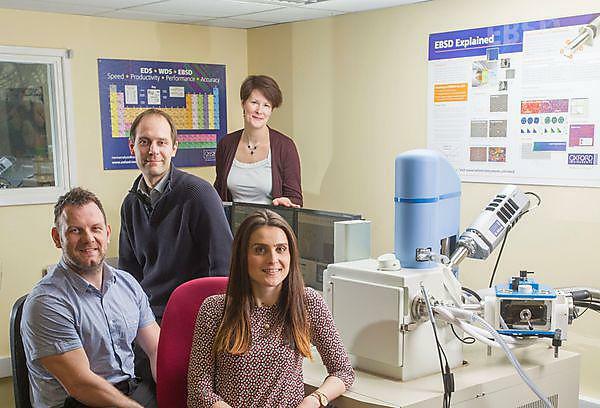 The facility includes Plymouth Electron Microscopy Centre (PEMC), which offers a comprehensive suite of light microscopes and electron microscopes, equipped with cutting edge image processing and analysis software. Barden started working with PEMC 20 years ago, to conduct quality control checks on its products. Now the company is training its precision engineers to use the centre and is using it as its own ‘outsourced laboratory’. The Barden Corporation is a world leader in the design and manufacture of super precision ball bearings, which are used in all kinds of sectors including aerospace. Based in Plymouth, Barden is part of the aerospace and super precision division of leading automotive and industrial supplier Schaeffler and employs in excess of 400 staff. Established over 30 years ago, PEMC was recently transformed as part of a £1.3 million project, funded by the University, JEOL (UK) Ltd and a £579,960 grant from the European Regional Development Fund (ERDF), which gave businesses free access to its state-of-the-art facilities. Barden accessed PEMC’s expertise, through GAIN (the Growth Acceleration and Investment Network). GAIN is enabling Plymouth University to work with partners across the South West to help businesses achieve their growth potential.